The harvest has been gathered and stored and the big tidy up has begun in earnest in the Kitchen Garden this month. 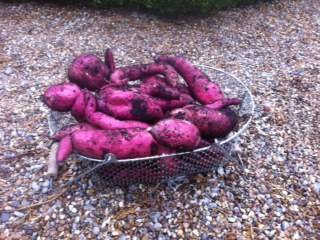 On a mild and sunny day at the beginning of the month, Jo dug up a bumper crop of potaotes. 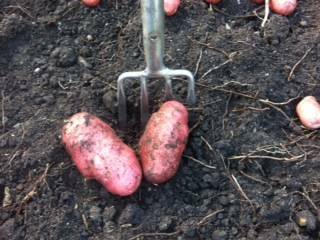 Our maincrop varieties were 'Cara' and 'Desiree' and we harvested some lovely large, clean tubers. We will certainly be growing these ones again next year. The tubers were left to dry in the sun before being stored in sacks in my larder. Perhaps our most successful crop of the year for 2013 were our Sweet Potatoes. 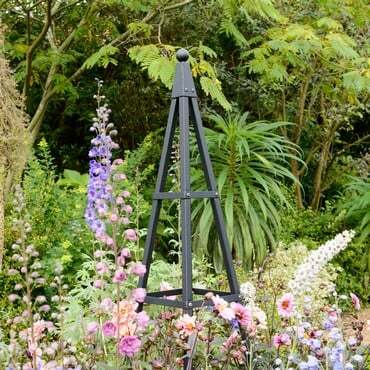 These have looked amazing all summer long, trained up an obelisk and spilling over the edges our a Superior Raised Bed. With apprehension, Jo climbed on the raised bed and dug the tubers out with a Potato Harvesting Scoop to avoid spearing any. A bumper crop emerged from the soil, including some enormous tubers. These were left in a warm place for a week for the skins to cure and are now stored in a sack in my larder while I research some recipes that will do them justice. I thoroughly recommend this crop. It really deserves a place in any vegetable plot. Also this month, we have continued harvesting the apples from our espalier trees. This is another kitchen garden crop that looks amazing all year long. 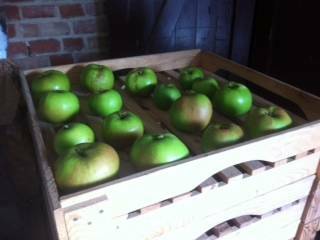 The apples have been stored in an apple rack ready for use. We've also picked our Butternut Squash in the last few days and these are now laying in the greenhouse while their skins harden. As well as harvesting, this month we have also been planting out the rest of our garlic crop. The Early Purple Wight, sown in September is already growing well. We have sown Broad Beans into Rootrainers ready to plant out later in the Autumn. We prefer this to sowing direct as we have mice that like to pinch our seeds. The tomatoes, peppers and aubergines have just about finished cropping, so we’ve begun cleaning the greenhouse. We’ve been taking the staging and pots out and giving all the surfaces if the greenhouse and its contents a thorough clean with a Natural Greenhouse Cleaner. This will prevent pests and diseases from overwintering. Our greenhouse is quite big so this process will take a week or two to complete. Then it will be bubble wrapped ready for the Winter. Outside the leaves are already falling thick and fast so we set up the leaf composter and started to fill it. A good leaf rake and a set of grabbers is a must for this job. Raking leaves is my least favourite job of the gardening year. I’ll be glad when it’s over! We’ve been emptying and refilling our tumbler compost bins all summer long, but at this time of year we turn our attention to our wooden compost bins. One side is now full of lovely crumbly compost ready for spreading on the ground as we clear it. The other side is ready for filling and into this we put the old tomato, pepper and aubergine plants along with the stems from the butternut squash. Over the winter we continue adding to this as we harvest overwintering crops and next Autumn it will be rotted down ready for use. Jo has pruned the blackberries this month, now that they have finished fruiting. The old fruited stems have been pruned down to the ground and the new stems have been tied in ready for next year. We have already have some strong winds in the Kitchen Garden this Autumn, so we’ve checked that all our structures are securely pegged down with extra long steel ground pegs to stop them blowing over and leaving our crops at the mercy of hungry pigeons! Clear debris quickly to keep the garden tidy and prevent pests and diseases from over wintering. 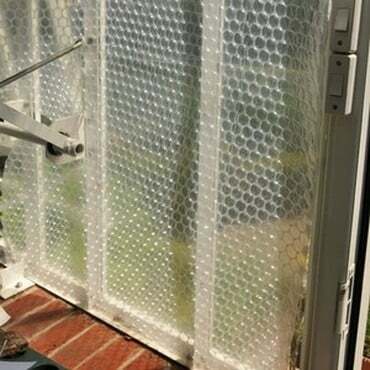 Finish cleaning and bubble wrapping the greenhouse. Tidy the potting shed and clean and sharpen the tools. Check the rabbit fence and repair any holes. Prepare the ground for new raspberry plants. Dig over beds and add organic matter.